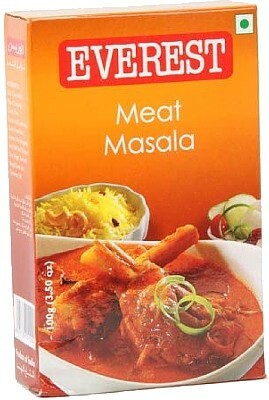 Buy Everest Brand Masalas and Spices in the USA! Chaat is a racy blend that gives a wild and lively tweak to the well worn taste of Salads, Sandwiches, Fresh fruits, Finger chips, Snacks, Soft drinks, Sprouted beans... you name it. Just sprinkle, and savour, a new kind of excitement. Ingredients: Asafoetida, Bishops Weed, Black Pepper, Black Salt, Caraway, Chilli, Clove, Coriander, Cumin, Dry Ginger, Dry Mango, Kachri, Malic Acid, Mint Leaf, Nutmeg, Pepper Long, Pomegranate Seeds, Rock Salt. 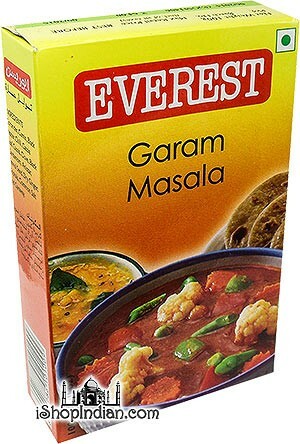 An exquisite blend of 24 pure spices, this is perhaps the most elaborate blend in the Everest repertoire. This blend is evenly balanced for taste and flavour and imparts a rare character to chhole, made from chickpeas. 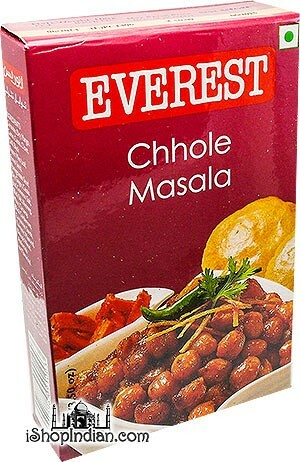 Used almost invariably in a variety of preparations involving chickpeas - chhole being the most popular. Served hot with rotis or fluffy bhaturas, chhole is a regular fare for lunch and dinner in North India. Ingredients: Asafoetida, Bishops Weed, Black Cardamom, Black Pepper, Black Salt, Cardamom, Cassia, Cassia Leaf, Chilli, Cloves, Cardamom Seeds, Coriander, Cumin, Dry Ginger, Dry Mango, Fennel, Kachri, Mace, Mint Leaf, Mustard, Nutmeg, Pomegranate Seeds, Common Salt, Tamarind, Turmeric. A select blend of 13 spices go into this grand old universal taste enhancer. Being chilli based, it provides an exotic red gravy to dishes. It is widely used all over India on account of its being a less pungent garam masala. Fennel, Tejpatta (Cinnamon leaves), and Trifala imparts a cooling effect to this blend. 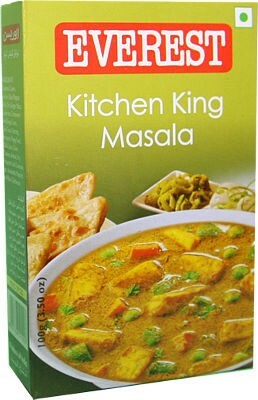 It is used essentially for preparing vegetarian dishes requiring a gravy. Gujaratis and Marwaris normally use it in lentils (dal), and for filling in snacks such as samosa, usal, patra, farsan etc. Ingredients: Anistar, Black Cardamom, Black Pepper, Caraway, Cassia, Cassia Leaf, Chilli, Clove, Clove Leaf, Common Salt, Coriander, Cumin, Dry Ginger and Fennel Seeds. This pack contains Fine ground red chillies of the finest quality distinguished by their brilliant red color and mild pungency. Carefully graded chillies, hygienically ground and scientifically packed to retain their brilliant red color and farm fresh flavor. No artificial colors used. xplore the 'Curry' experience with this classic blend that gives vegetable curries a lordly taste and a mild, subdued flavour. Being coriander and turmeric based, the blend gives curry an appetising golden hue. It is the recommended blend to prepare India's much loved vegetarian dish - India cheese in fresh green peas: Mattar Paneer. 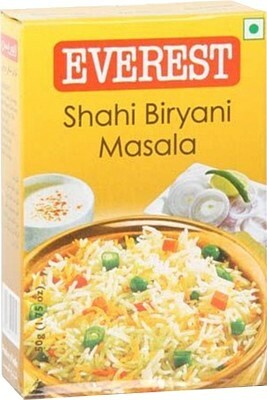 Paneer curries and light gravies are enhanced with the fragrance and taste of Everest Kitchen King. 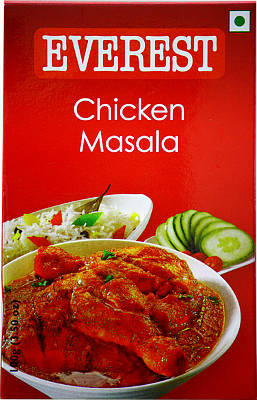 A pepper-coriander-chilli based blend that imparts a dark tan and a hot taste to non-veg dishes, especially meat. 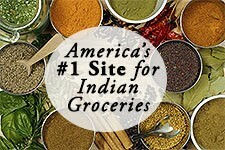 Since Indians love their meat really spiced up, a fair amount of flavoring spices lend this blend an aromatic chorus. Great in all meat preparations requiring a dark gravy. Ingredients: Anistar, Bengal Gram, Black Pepper, Cardamom, Cassia, Cassia Leaf, Chilli, Clove Leaf, Cloves, Common Salt, Coriander, Cumin, Dry Ginger, Fennel, Garlic, Kasuri Methi Mint Leaf, Mustard, Turmeric. Pani' in Hindi means water. 'Puri' is a fried hollow ball made from wheat flour. The 'Puri' is punctured open on one side and stuffed with delicious fillings and topped with Pani. The 'Puri' is then eaten in a mouth full. This is one of India's most popular outdoor snacks. Black Pepper, Tamarind, and Dry Ginger combine together to give a sharp twinkle to this Everest Blend that spices the 'Pani'. Ingredients: Asafoetida, Ajwain, Black Pepper, Black Salt, Chilli, Cumin, Dry Ginger, Dry Mango, Malic Acid, Mint Leaf, Rock Salt, Tamarind. 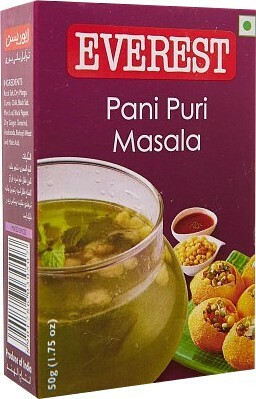 Pav bhaji masala is the blend that took Mumbai by storm. 'Pav' means a bun shaped home made bread. 'Bhaji' means mashed vegetables. From its humble origins in the by-lanes of Mumbai, it has become a 'must' on menus in 5-STAR restaurants and celebrity weddings. Dished out in the far-flung corners of the country, it has acquired the status of a foremost vegetarian recipe. Equally popular as a snack or a meal, this easy-to-cook dish enjoys a special place in the hearts of house wives. Ingredients: Anistar, Black Cardamom, Black Pepper, Cassia, Cassia Leaf, Chilli, Clove, Common Salt, Coriander, Cumin, Dry Ginger, Dry Mango, Fennel, Turmeric. 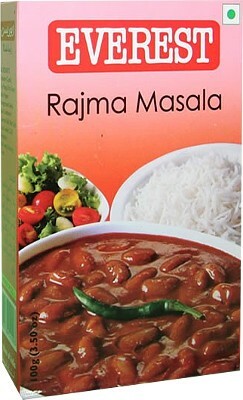 Delectable blend of spices for a classic kidney beans curry dish. Easy to use recipe provided on the back of the box. 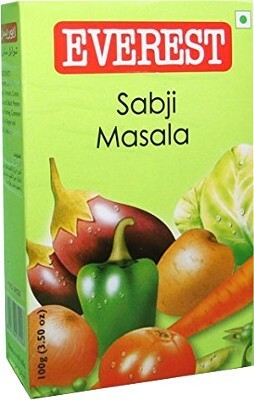 If you need to rustle up a quick vegetable curry, all you need is your favorite vegetable/s and Everest Sabji Masala, the 'one-stop' masala. That's right, you do not need any other spice to make your dishes tempting and irresistible. 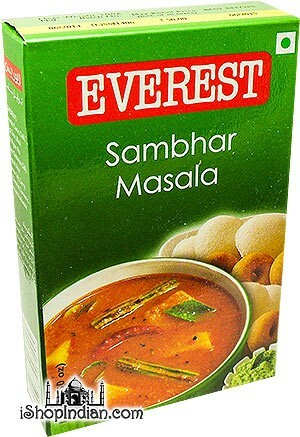 Everest Sabji Masala is just the right handy must-have for all those who simply don't have the time for elaborate cooking, but would like to prepare delicious, appetizing vegetable dishes all the same. Ingredients: Black Cardamom, Black Pepper, Cassia Leaf, Chilli, Clove, Common Salt, Coriander, Cumin, Dry Ginger, Dry Mango, Nutmeg, Turmeric. Sambhar is a wonder recipe from the South of India and can be aptly described as a 'designer health food'. The various dals, vegetables, spices and condiments that go into a typical Sambhar gives all the nutrients the body needs. Sambhar can be had with rice as a South Indian does it almost everyday, or with Idlis, Wadas, Potato Wadas etc. Sambhar, especially with Idlis has gained universal acceptance in India, and is considered as an excellent diet food. Ingredients: Asafoetida, Bengal Gram, Black Gram, Cassia, Chilli, Common Salt, Coriander, Cumin, Curry Leaf, Fenugreek, Pigeon Pea (Toovar Dal), Rice, Tamarind, Turmeric. Largely a combination of flavouring spices used along with taste-agents like black pepper & chilli to impart a pleasantly textured flavor to ordinary rice. The origins of this blend can be traced back to the Mughal era. Ingredients: Black Cardamom, Black Pepper, Caraway, Cardamom, Cassia, Cassia Leaf, Chilli, Clove, Clove Leaf, Coriander, Cumin, Kasuri Methi, Mace, Nutmeg, Turmeric. 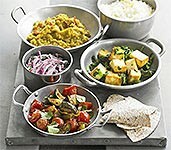 Paneer is one of the best epitome of Vegetarian Dishes to add the palate to the Indian Cuisines. 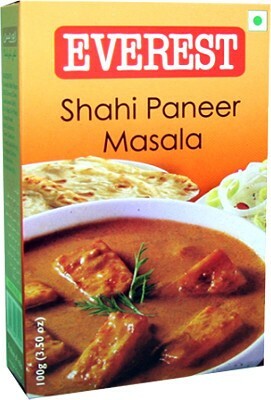 Everest Shahi Paneer Masala is the fine grade and quality spices to enhance the taste of Shahi Paneer you prepare to delight your taste buds. The aroma, color, taste and texture of the astonishing varieties of spices in India nourish a rich variety of cuisines and cultures. Earlier, spices were chosen, measured, pounded and mixed, all in the kitchen. It took hours to prepare these spice recipes passed down by generations. Today, millions of homes enjoy the same authentic taste and aroma of traditional delicacies, with Everest's perfect blend of pure spices. These blends even bring the regions closer by providing the authentic taste of other regional cuisines, in the convenience of a pack, at home. 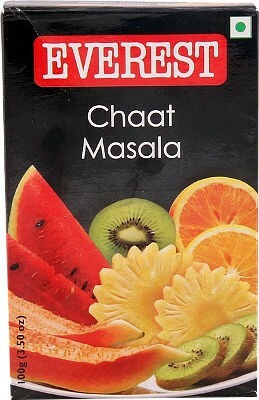 That's why we think, Everest brings India closer through taste! This Everest blend strikes an even balance between aromatic and flavoring spice agents to give chicken a luscious, inviting flavor. Since this blend is used in 'apply-and-cook-over-the-fire situations', the flavoring spices predominate, in order not to dissipate under direct fire. 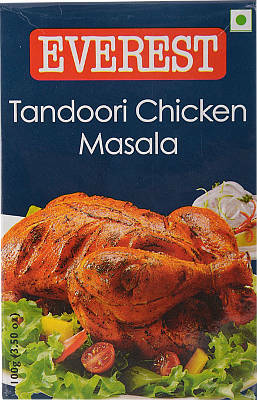 In most non-veg., marinate-and-cook-over-the-fire preparations such as chicken, fish etc. Ingredients: Anistar, Asafoetida, Black Cardamom, Black Pepper, Cassia, Cassia Leaf, Chilli, Clove, Common Salt, Coriander, Cumin, Dry Ginger, Garlic, Mustard, Nutmeg, Pigeon Pea (Toovar Dal), Poppy Seed, Turmeric. This pepper and ginger based blend gives a very special twist to the taste of tea. The ginger and pepper elements in the blend adds an extra warmth that can take the chill out on wintry days. 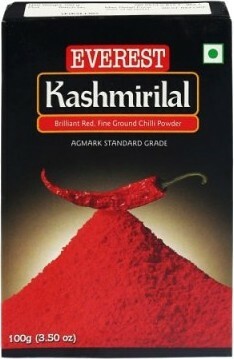 Used most commonly to add a spicy-warm flavor to tea and milk. It is also used to make 'Ukala'*, a drink popular in Western India. 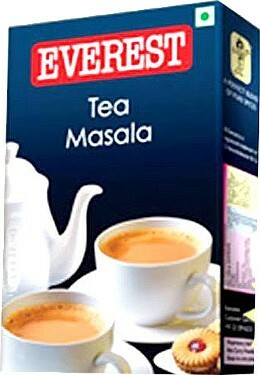 To get the best flavor add Everest Tea Masala while you boil water to make tea. 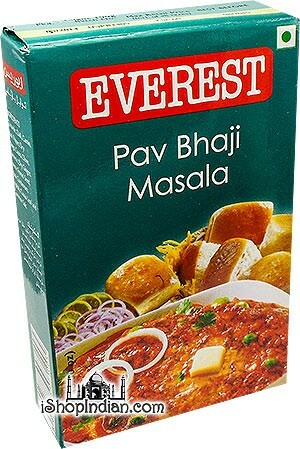 For 2 cups of tea ¼ tsp of Everest Tea Masala will suffice. It not only adds a special flavour to your tea but also make you come alive with freshness.